Based in Florida, Andrea Cooley has been writing professionally since 1990. Her work has appeared in "Imago" magazine, and in 2007, she wrote a manuscript on healthy aging that resulted in the publication of a book. Cooley holds a Bachelor of Arts in English from the University of South Florida. You can protect your skin from the signs of aging and the damaging effects of UVA and UVB rays by wearing sunscreen labeled "broad spectrum." If you perspire heavily or engage in outdoor physical activity, pick a waterproof or sport sunscreen. To protect your face, check labels to find products for sensitive skin or faces. If too many choices lead you to indecision, keep it simple. Choose a broad spectrum sunscreen with a sun protection factor of at least 30 and wear it daily. Aveeno Continuous Protection, a broad spectrum UVA/UVB sunblock, provides waterproof coverage in a spray. Aveeno ranks fourth on the "Consumer Reports" list of best sunscreens. "Allure" magazine also picked Aveeno as Editor’s Choice. Aveeno has the Seal of Recommendation from the Skin Cancer Foundation, recognizing it as a safe and effective sunscreen. Aveeno contains avobenzone, homosalate, octisalate, octocrylene and oxybenzone. Badger Face and Body is a chemical-free, waterproof, broad-spectrum sunscreen lotion. The Environmental Working Group gives Badger its highest score of 1, while Consumer Reports ranks Badger ninth. Badger contains micronized zinc oxide, a physical sunscreen that reflects and scatters UV radiation, according to the U.S. Food and Drug Administration. The microparticles make application transparent, unlike the old days of the white-nosed lifeguard. Banana Boat Sport Performance, a spray sunscreen, provides full-spectrum, waterproof protection. The label says it's non-greasy and quick-drying. "Consumer Reports" ranks this product third among sprays. Active ingredients include avobenzone, oxybenzone and octocrylene. This sunscreen carries the Skin Cancer Foundation's Seal of Recommendation. Chemical- and fragrance-free, Blue Lizard Australian Sunscreen lotion provides waterproof and UVA/UVB coverage. Blue Lizard scores a 3 with the Environmental Working Group. "Allure" magazine recommends Blue Lizard for faces and sensitive skin, stating the sunscreen is non-greasy and won’t clog pores. Blue Lizard contains physical sunscreens zinc oxide and titanium dioxide. Bull Frog offers this fast-drying cool gel to protect you from UVA/UVB rays. It's also waterproof. "Real Simple" magazine rates Bull Frog as the best gel with an SPF of 30 or higher. 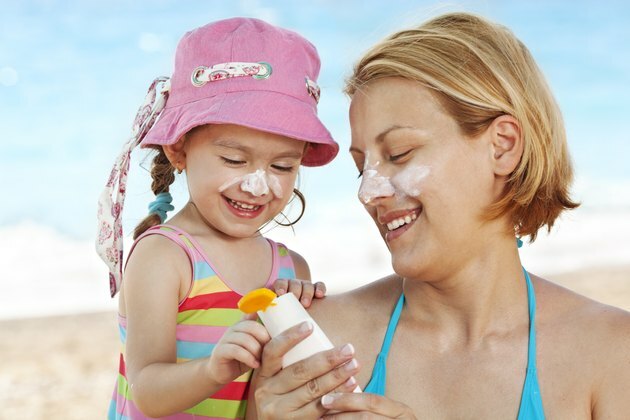 Active sunscreen ingredients include avobenzone, homosalate, octisalate, octocrylene and oxybenzone. This convenient sunscreen stick quickly covers ears, noses, lips and eyelids. "Real Simple" magazine rates Hawaiian Tropic Ozone as the best sunblock stick with an SPF of 30 or higher. This stick provides UVA/UVB protection, is waterproof and claims it won’t run in your eyes. Hawaiian Tropic Ozone wears the Skin Cancer Foundation's Seal of Recommendation. The sunscreen contains homosalate, octocrylene, octinoxate, oxybenzone and octisalate. La Roche-Posay provides full-spectrum UVA/UVB coverage, is waterproof and costs 10 times more per ounce than Banana Boat. La Roche’s label advertises that it's light, non-greasy and fragrance-free. This sunscreen cream scores a 2 with the Environmental Working Group and ranks 10th with "Consumer Reports," and earns the Seal of Recommendation from the Skin Cancer Foundation. Ingredients include ecamsule, avobenzone, octocrylene and titanium dioxide. "Allure" magazine picked this as favorite facial sunscreen. Offering waterproof and UVA/UVB protection, Neutrogena Ultra Sheer claims to be non-greasy, leaving skin soft and smooth. "Real Simple" calls this sunscreen the best lotion with an SPF of 30 or higher. This sunscreen contains avobenzone, homosalate, octisalate, octocrylene and oxybenzone. No-Ad Ultra Sunblock Lotion is a waterproof, sweat-proof broad-spectrum sunscreen. "Consumer Reports" ranks No-Ad Ultra seventh. This sunblock has earned the Skin Cancer Foundation's Seal of Recommendation. Ingredients in No-Ad include avobenzone, homosalate, octisalate and oxybenzone. "Consumer Reports" ranks Target Up & Up Sport Continuous SPF 30 as No. 1. It is waterproof, provides full-spectrum UVA/UVB coverage and has the lowest price per ounce compared to the other sunscreens "Consumer Reports" evaluated.